Bournemouth defender Charlie Daniels has agreed a new three-and-a-half-year contract with the Premier League club. The 29-year-old, who joined the Cherries from Leyton Orient in November 2011, has missed just one league game in the club's first top-flight season. 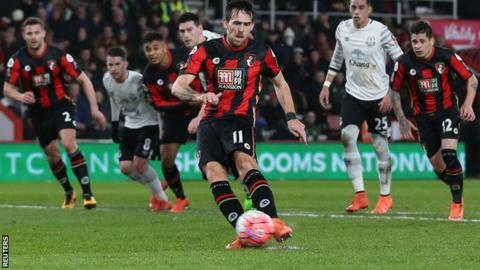 "He has been outstanding for us this season and performed at a really high level consistently," manager Eddie Howe told BBC Radio Solent. "I'm really pleased he has committed his future to us," he added. Daniels' performances at left-back have led to talk of a potential England call-up ahead of this summer's European Championships, something his manager believes would be fully deserved. "I believe in every single one of my team, so why not?" Howe added. "Charlie has been consistent all season and I think that's his biggest quality. "You would struggle to think of too many games where he hasn't given a really accomplished performance. "When you consider the calibre of the players he has been up against every single week in those positions, that's no mean feat."